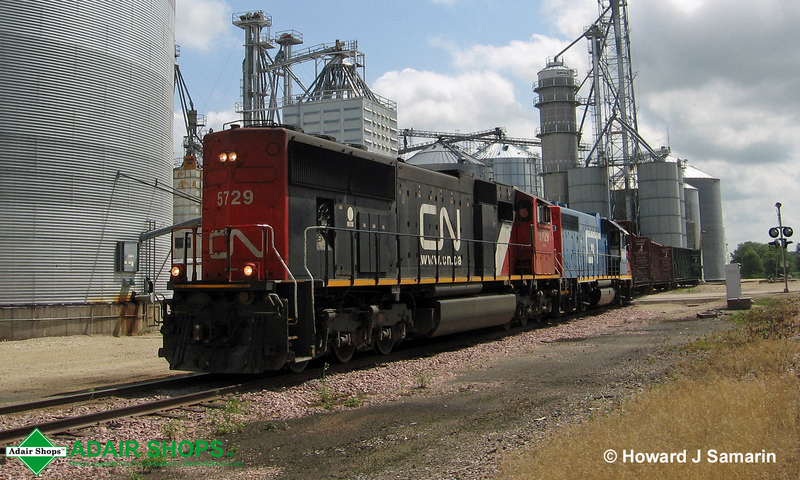 The Canadian National runs a local out of Dubuque, IA that serves industries west of town. Making stops in Peosta, Farley, Dyersville, Delaware, and Manchester, this local often draws a pair of 4 axle locomotives, although that isn't always the case. We have 3 such rather unique examples for you. In May of 2009, we captured this lone CN SD40-2W making a pickup of empty center beam flatcars at our Dyersville team track. While not ideal for the engineer, this local is running long hood forward for it's westward trip. As we can see from the photo, the local consists of one load, either to be dropped off here for our local truss manufacturer, or being spotted at a lumber yard in Delaware. 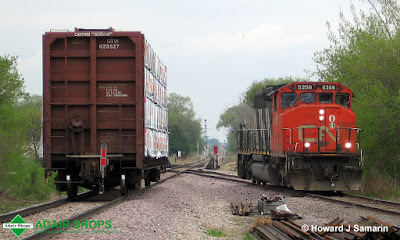 A year later (May 2010), the Dubuque local is "borrowing" a BNSF SD70MAC for power. Again, with a single unit running long hood forward, the westbound leg of the trip will not be ideal for the engineer. Given that there aren't any cars visible on the mainline behind the power, this is another over powered local. 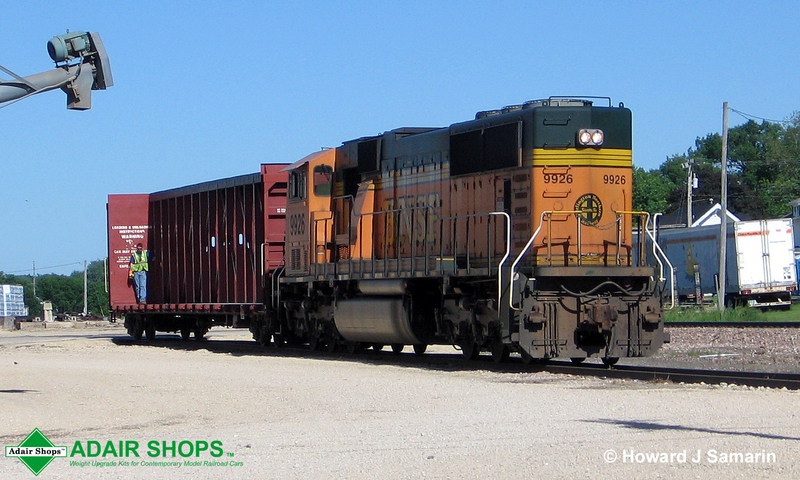 With only a single car in tow, this locomotive is handling more like a sports car, as it's normal assignment is handling 14,000 ton coal trains out of the Powder River Basin in Wyoming. Back in 2010, the BNSF would hand off a loaded Powder River coal train to the CN in Sioux City, IA. 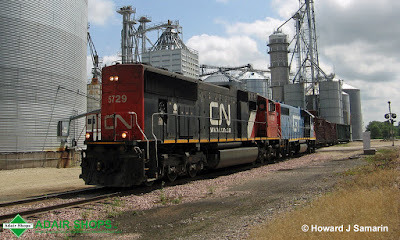 The CN would run the train across Iowa to East Dubuque, Illinois where there was a rail to barge transfer facility. 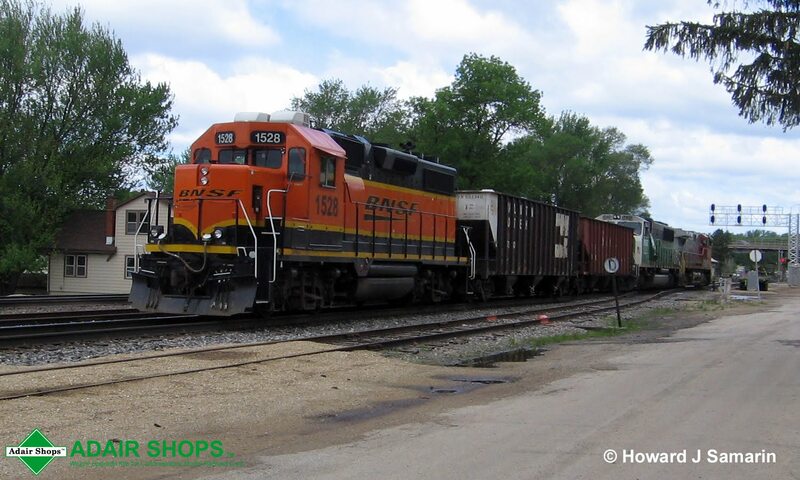 Our guess is that this single BNSF unit was the DPU on a coal train, and instead of leaving it in East Dubuque, it was brought across the Mississippi River to Dubuque. In July of 2016, the Dubuque local is making good use of a CN SD75I and a former GTW GP38-2 for power. Again, we are in Dyersville, and the local is picking up a rather sizeable cut of empty center beam flatcars. And once again, both locomotives are facing the wrong direction for the westbound trip. The only place to turn locomotives close to Dubuque is at the wye at Manchester. 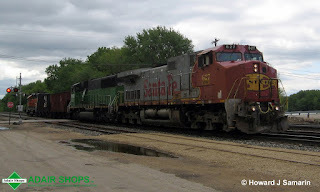 Given that the Dubuque local usually terminates is westward trip there, if the locomotive(s) are facing the right direction for eastbound movement, the crews will forgo turning the power in favor scooting back to Dubuque and completing any en route switching. Remember sometime back when Model Railroader magazine did a series of articles on passenger trains you can model? The articles were based on prototypical short trains that would fit the average home layout. Well, we bring you a freight train that you can model. The above BNSF northbound train was captured in May of 2016 at East Dubuque, IL. Consisting of three road engines and two hopper cars, this train would fit nicely on even the smallest home layout. While sub-lettered for the BNSF, the former Santa Fe warbonnet C44-9W is still carrying it's original lettering and number. Not bad considering the BN and the ATSF merged almost 20 years ago. Here's the caboose for this very short train. 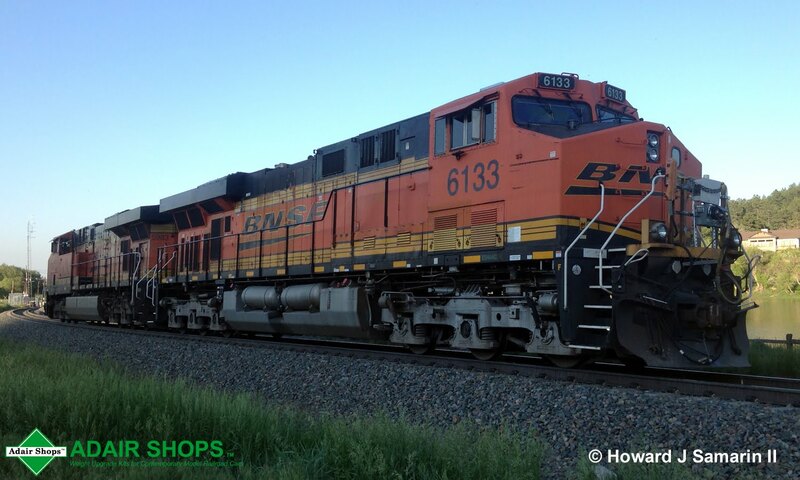 BNSF 1528 is a GP28M and was rebuilt from a NP GP9 by the BN. Here's something from our son. He photographed the above two ES44AC's in June of 2016 after they assisted a loaded grain over the summit at Palmer Lake, CO. Manned helpers on the Joint Line between Denver and Pueblo were once common place, but have become much less frequent since the advent of DPU's. Here's the interesting thing though. These helpers were cut off the rear of the train... ON THE FLY! Our son couldn't believe it. Neither could his friend who is a local railfan. Quit frankly, we couldn't believe it either. But, it really happened. As to how it happened, the boxes attached to the front handrails and plugged into the MU cable had something to do with this feat. At the time the rear helpers were cut off, the conductor was in the cab, so the couple pin was mechanically pulled by the boxes. 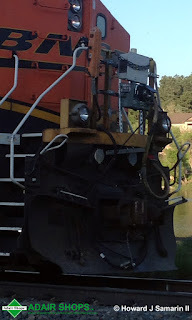 The photos were taken with a cell phone, and it was late in the afternoon (and in the shade), so the photos aren't be best quality, but you can see device, and what looks like a FRED attached to the brake hose. So the next time you're looking for something unique to model, give this a try. With DCC, this prototype practice could actually be done in model form.